Ruby Goldstein spent more than 35 years in the boxing ring, first as a prizefighter and later as the referee of Charley Goldman matches featuring some of the greatest boxers of all time. Although he enjoyed an outstanding career as a lightweight and middleweight contender, he is remembered mostly by contemporary boxing observers as the third man in the ring for 39 world championship fights. During his 21 years as a boxing official, from 1943 to 1964, Goldstein refereed such historical battles as the brutal 1946 Zony Zale vs. Rocky Graziano classic, the 1952 Sugar Ray Robinson vs. Joey Maxim opus, the 1957 Ingemar Johannson vs. Floyd Patterson clash, and Joe Louis’ title fights against Jersey Joe Walcott and Rocky Marciano (Louis’ last). Only Arthur Donovan refereed more heavyweight championship fights, and no one worked more title bouts in all divisions than Goldstein. Putting on the gloves for his first professional fight at the age of 17 and appearing on the cover of The Ring magazine just one year later, Goldstein went on to win his first 23 bouts, developing into a remarkable lightweight and middleweight contender. His extended boxing career—he retired periodically—ranged from 1925 until 1937. Billed as the “Jewel of the Ghetto,” he won 50 of 55 professional fights—34 by knockout. All five of his losses were by early knockouts in the fourth round or before. In 30 of his own knockouts, his opponent failed to make it past the fourth round, and a dozen fell in round one! 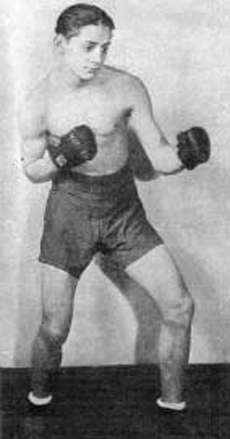 Goldstein is ranked by The Ring magazine and author Ken Blady, in his book The Jewish Boxers’ Hall of Fame, as one of the top 10 Jewish-American boxers of all time. Fred Graham’s book The Third Man in The Ring celebrates Goldstein’s career as a referee.